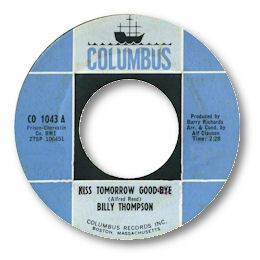 Kiss Tomorrow Goodbye” is an evergreen blues ballad and this version of Al Reed’s song for the Columbus label out of Boston is certainly amongst the best. Billy Thompson’s light tenor voice and slightly lisping delivery rather suit the feel of the song which was originally cut by Danny White on Frisco in 1962. The arrangement is similar to the original but the bridge section improves on it in my view. Lovely. Arranger Alf Clausen is making rather more money these days as he deals with the music on The Simpsons. "Earlier tonight I spoke on the phone to Herschel Dwellingham who grew up in Bogalusa, LA (where he lives again now) and moved to Boston to attend Berklee and after became THE arranger, producer and session drummer for basically all the R & B and Soul records that came out in Boston between 1963 and 1973. He also was the band leader and drummer at the biggest and best Boston Soul Club at the time, The Sugar Shack, in addition to writing and arranging commercial jingles at Ace recording studios in Boston's famed combat zone. Herschel really transformed the Soul Scene in Boston by combining the southern sound he had gotten growing up in Bogalusa (about 70 miles north of New Orleans) with the formal training he received at Berklee. In fact, the first record he produced in Boston was a cover of a big New Orleans hit "Kiss Tomorrow Goodbye" which had been recorded by singer Danny White. Herschel's version is a great example of that combination of styles and was sung brilliantly by Billy Thompson and arranged by Herschel's friend from Berklee, Alf Clausen who later went on to garner much fame for arranging and writing for The Simpsons!" 1. "Kiss tomorrow goodbye" can be found on the Ace UK CD "When A Man Cries". 2. Note ~ I'm really grateful to Eli for all this great new info on the background to the Billy Thompson release. Check out Eli's website here for news of his latest release which should include his version of "Young Girl". And also do catch him live if he comes near your town - he always gives a fantastic soulful show.